Theatre culture has, to some extent, been restored in Lahore thanks to quality work from groups such as ‘Theatre Hub’, where exemplary work and competent actors are produced each year to entertain the audience and to give them something better every time. 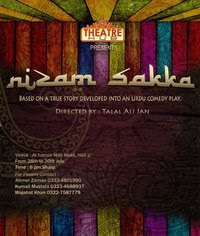 This year Theatre Hub has brought a period Urdu comedy play under the name of Nizam Sakka (based on a true story), directed by Talal Ali Jan, which will be held from 28th to 30th July at Alhamra Mall Road, Lahore. The story revolves around a water carrier who saves the Mughal emperor, Humayun, from drowning during a combat with Sher Shah Suri and as a reward, King Humayun grants Nizam Sakka the Kingship of the subcontinent for one day. It is a dream come true for the ordinary man who does the craziest things which are bound to leave the audience in fits of laughter. Everyone is working hard to put up a great show for the audience on 28th, 29th and 30th of this month, Hall 2 Alhamra. Expectations are high from Theatre Hub which has produced popular plays like ‘Ishq with a Twist’, ‘Jaal’ and ‘Khatra-e-Jaan’. However, ‘Nizam Sakka’ is expected to surpass the benchmark set by each of Theatre Hub’s previous plays. The latest play will definitely raise the bar of quality plays in Lahore and provide good entertainment for theatre lovers. All the best to Theatre Hub for pulling off yet another theatrical hit.